Another magazine preview of GTA IV showed up today, this time it's the latest issue of the Official Xbox Magazine in the UK. The demo given to them was the same introductory preview given to previous magazines, containing an interview with Dan Houser, Vice President of Creative for Rockstar Games. Below is a summary of new information from the article. We suggest reading the information from OPM and Game Informer first if you haven't done so yet. According to the magazine, GTA IV is currently 66% complete. When Niko pulls out a pistol, a crosshair with a simple black cross within a circle shows up on the screen. This could be an indication of manual aiming being available in the game. Rockstar's humorous take on the number 69 makes an appearance yet again in GTA IV, the editors of the magazine saw a sign for a "69th Street Diner". Another building called "Twitchins", the GTA version of Brooklyn's Domino's Sugar Factory, is in the game. Niko will be able to climb and descend exterior fire escapes and some meetings will take place high in the office buildings of skyscrapers. It's said that from on top of them you'll be able to throw people off. Hand to hand combat is also being reworked on for GTA IV, and will feel "much more natural" than before. One of the radio stations includes an "Eastern European-sounding" dancing station. Players will be able to change their camera views whilst in a car according to their needs. This however is said to still being experimented on, and that Rockstar want to give better control and "immediacy" to players. For confirmation, boats will be making a return and the handling is "really nice". 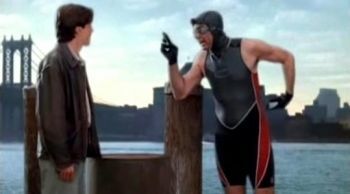 Above: Kramer, about to take a dip in the East River. Niko will likely be able to do the same. When selecting your mobile phone, a zoomed-in version of the mobile screen pops up in the bottom right-hand corner of the screen, where you can use its address book to pitch for "jobs" with gang contacts among other things. One of the things that makes it easier for Rockstar setting GTA in a fictional New York is that they sometimes get a call from the developers at Rockstar North in Scotland, wanting to know more about a specific building or traffic flow in a certain area, for instance, and using their in-house researchers in NYC they can easily assist the guys back at R* North. Dan Houser is quoted saying that the Liberty City in GTA IV is bigger than any single city they've done before, giving a more clear indication of the physical size of the game. He continues saying that the "detail" of the game is the big thing. He also confirms Central Park to be in the game, though it's fictional name is still unknown to us. "Fun ridiculous" weapons is said to be in the game, because R* is not going too "naturalistic". Special thanks to Loose Head! Discuss this at our forum.